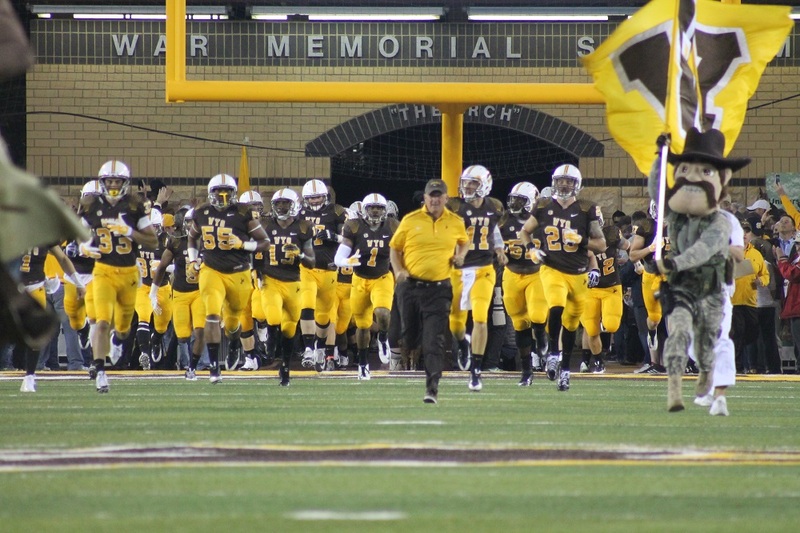 What began as a promising start for Wyoming quickly turned into the second consecutive home loss of the season for the Cowboys as the Eastern Michigan Eagles captured a 48-29 victory in Laramie in the first meeting between the two schools. The Cowboys would lose their starting quarterback for the second consecutive week when sophomore Josh Allen, making his first start for injured senior Cameron Coffman, would be forced from the game with an injury to his shoulder area on Wyoming’s second possession of the game. Wyoming head coach Craig Bohl said after the game that he thought Allen would be out at least 6-8 weeks. Despite the key loss at quarterback, Wyoming’s rushing attack showed signs of what it can be as the Pokes rushed for 430 yards, marking the first time a Cowboy team had done that since rushing for 451 against San Diego State in 1988. Sophomore running back Brian Hill recorded the second 200-yard rushing performance of his career, ending the day with 242 yards on 21 carries and scoring two rushing touchdowns. Senior running back Shaun Wick ran for 76 yards and one TD, and moved into the No. 8 spot in career rushing at Wyoming. Wick has rushed for 2,173 yards during his Wyoming career. He moved past Dabby Dawson (2,124 yards), Alvester Alexander (2,127) and Walt Goffigan (2,167) on Saturday. Redshirt freshman quarterback Nick Smith added 65 rushing yards on 10 carries. But the Cowboy defense was unable to stop EMU’s offense, giving up 506 total yards to the Eagles — 330 passing yards and 176 rushing. Bohl had these comments following the game. “Eastern Michigan did a great job of adjusting,” said Bohl. “They didn’t have their starting quarterback in there either. They ran the ball extremely well and threw the ball well. “I really was encouraged by our rushing attack. I think that can be a sign of the times. We had a true freshman tackle (Zach Wallace) in there. There are some positive things there. Not a ton of positive things, but I appreciate the effort by a lot of young guys in the second half. I thought they came out and continued to stay in the fight. The way we were running the football, we had a shot to flip it around. Sophomore quarterback Allen proceeded to lead the Cowboys on an eight-play, 84-yard scoring drive on its first possession. Allen completed 3 of 3 passes for 32 yards on the drive. Sophomore running back Brian Hill carried the ball three times for 46 yards and freshman wide receiver Justice Murphy scored his first career touchdown on a rush for five yards to give Wyoming a 7-0 lead. Eastern Michigan responded on its second possession of the game when its own sophomore backup quarterback Brogan Roback drove the Eagles 75 yards in three plays, keyed by a 57-yard pass completion to wide receiver Dustin Creel down to the Wyoming 15-yard line. Running back Shaq Vann ran the ball in from 15-yards out on the next play, and the game was tied at 7-7. Things would start to go bad for the Pokes five plays later. After a run of 11 yards by Allen, EMU was called for a personal foul penalty on the next play. Allen then rushed for five yards followed by his first incompletion of the day. On a third and five from the EMU 44-yard line, Allen took off on a 24-yard run to the EMU 20, but Allen chose to take on the tackler and the result was an injury to Allen’s shoulder area that ended his day. Redshirt freshman QB Smith entered the game for the Cowboys, and after a one-yard run by UW senior Shaun Wick and a six-yard loss on a screen pass to Hill, Wyoming was forced into a 42-yard field-goal attempt that true freshman Tristan Bailey missed to the left. Following the missed field goal, Eastern Michigan took over at its own 25-yard line and would proceed to drive the ball 75 yards in 11 plays to take a 14-7 lead. On the ensuing kickoff, EMU place-kicker Brendan Renius executed a perfect onside kick, tapping the ball straight down the middle of the field and recovering the ball himself. Eight plays later, Roback connected with running back Darius Jackson for a 17-yard TD pass and EMU went up 21-7. The Cowboys put together a nice drive of their own going 49 yards in 10 plays for what looked like a successful 33-yard field goal by Bailey, which would have been the first field goal of his career, but a Wyoming holding penalty moved the ball back 10 yards and Bailey failed on his next attempt from 43 yards. The very next play saw the Eagles’ Vann break a 74-yard touchdown run for EMU’s third touchdown in five minutes and 58 seconds, to build the lead to 28-7. Eastern Michigan would add another touchdown and a field goal to extend its lead to 38-7 in the second quarter. Wyoming put together a nice sustained drive right before halftime, going 75 yards in 10 plays, including runs of 11 and 12 yards by quarterback Smith, a 14-yard run by Hill and a run of 16 yards from Wick that led up to Wick taking the ball into the end zone from one-yard out to narrow the lead to 38-14 with 17 seconds remaining in the half. For Wick it was the 20th rushing touchdown of his career, tying him for eighth place on the Wyoming career rushing TD list with former Cowboy Brett Smith. Like the first half, the Cowboys started well on their first possession of the second half. Starting with a 10-yard run by Hill and a pass completion from Smith to tight end Jacob Hollister for no gain, Hill then broke a 65-yard TD run, the longest of the season for the Cowboys. Smith ran the ball in for a two-point conversion to cut the lead to 16 points at 38-22. EMU followed that up with a quick strike of their own — a 64-yard TD pass from Roback to wide receiver Eddie Daugherty to expand their lead to 45-22, and roll to the win.